I initially thought I might give Tu-Lu's Gluten Free Bakery a miss because I thought there would be very little for me to try. However a NY local that had a fellow sensitive tummy encouraged me to go - and that was more than enough for me to get there quick smart. Sadly though I went there on the wrong day! Apparently Friday and Saturday are the days to go if you're vegan or dairy free as they make a range of cupcakes that you can gobble. Instead - I sampled an agave brownie, morning glory cake, choc chip cookie. The girl that served us also offered a panini as well and I decided to take up the offer. The reviews I've read about Tu-lu's are that their cupcakes are the star so I was kicking myself that I didn't make my way there on the right day. But as one friend said to me - never be disappointed for missing out on something while you're away because it just means you have an excuse to come back. So hopefully there will be a next time for me to try their dairy free cupcakes. 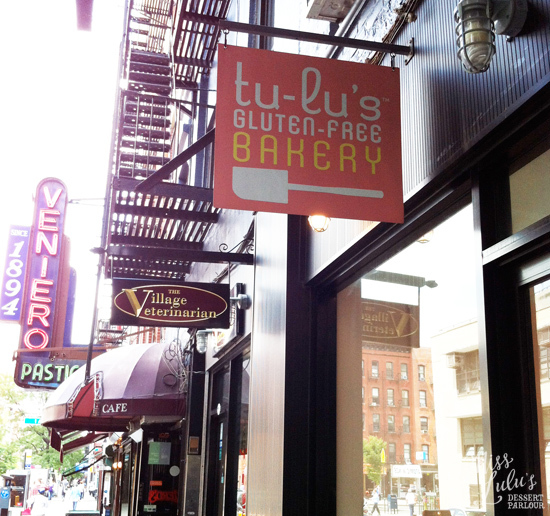 So here are the facts about Tu-Lu's Gluten Free Bakery - everything is gluten free - there are vegan and dairy free options - but if you're nut free sadly this isn't the place for you as they do use nuts on their products. There are no mentions of soy free - so you may have to get in touch with them before you go. Miss Lulu's Dessert Parlour brings back the fun and magic of childhood to the sensitive tummies out there that deserve the right to satisfy their cravings. Miss Lulu's Dessert Parlour is gluten free, dairy free, yeast free with no artificial colours and preservatives with soy free, egg free & vegan options. We don't use refined sugar (except in our sprinkles), we try to use organic wherever possible and we bake with lots of love! Come to see us this Saturday, 21st July! NEW YORK - Gluten & Dairy free PARADISE!!!! © 2012 Copyright MIss Lulu's Dessert Parlour. Powered by Blogger.